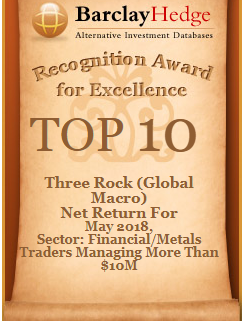 Three Rock Capital’s Global Macro Program also received a high commendation in the Specialised CTA category. Macro funds have struggled to make returns globally, falling 1.4 percent on average this year, according to data provided by Eurekahedge. Three Rock currently runs separately managed accounts for family offices and high-net-worth individuals, Kane said. The SMA platform — the Three Rock Global Macro Program — returned 9.5 percent this year through Nov. 21 this year. The fund has gained about 9 percent annualized since it started trading in January 2009. O’Mara was previously a foreign exchange trader at the Bank of Ireland and National Irish Bank. Before joining Three Rock, Kane worked at Barclays Capital, ABN Amro and the Bank of Ireland. Three Rock was called Anark Capital when it was launched by O’Mara in 2009. It was rebranded as Three Rock Capital Management — named after the Three Rock Mountain which overlooks Dublin — after Kane and Chief Operating Officer Fergal Cox joined in 2012. The greenback has been buoyed since the Nov. 8 vote by speculation the Republican’s proposals to increase spending and cut taxes will spur growth and inflation, nudging the central bank toward raising interest rates. The euro could reach parity with the dollar in 2017, according to Conor O’Mara, chief investment officer at Three Rock. The euro/dollar has traded between 1.05 and 1.15 since March 2015, with “a test of the lower side of this range appearing likely,” O’Mara said in a Nov. 14 commentary sent to investors. It’s a similar story for the yen, which O’Mara forecasts will weaken to between 112 and 115 against the greenback. Forecasts for stronger U.S. economic data added to the momentum triggered by Trump’s victory in the presidential election. A report Tuesday showing a 0.8 percent rise in retail sales in October followed an upwardly revised 1 percent jump the prior month, for the biggest back-to-back increase since 2014. Data Wednesday showing U.S. manufacturing increased for a second month helped drive the market-implied probability of a Fed hike in December to 94 percent. Federal Reserve Chair Janet Yellen signaled Thursday the U.S. central bank is close to lifting interest rates as the economy continues to create jobs at a healthy clip and inflation inches higher. The $312 millionLindenGrove Capital Discretionary Global Macro Strategy is down 1.5 percent this year through October, according to an investor letter seen by Bloomberg Briefs. Three Rock Capital, which manages $75 million, returned 5.6 percent in the first 10 months of the year, a separate investor letter showed.